Abcam’s ZAP70 Human in vitro SimpleStep ELISA™ (Enzyme-Linked Immunosorbent Assay) kit is designed for the quantitative measurement of catalase protein in Human cell and tissue extracts. The SimpleStep ELISA™ employs an affinity tag labeled capture antibody and a reporter conjugated detector antibody which immunocapture the sample analyte in solution. This entire complex (capture antibody/analyte/detector antibody) is in turn immobilized via immunoaffinity of an anti-tag antibody coating the well. To perform the assay, samples or standards are added to the wells, followed by the antibody mix. After incubation, the wells are washed to remove unbound material. TMB substrate is added and during incubation is catalyzed by HRP, generating blue coloration. This reaction is then stopped by addition of Stop Solution completing any color change from blue to yellow. Signal is generated proportionally to the amount of bound analyte and the intensity is measured at 450 nm. Optionally, instead of the endpoint reading, development of TMB can be recorded kinetically at 600 nm. ZAP70 is a tyrosine kinase that plays an essential role in the regulation of the adaptive immune response. ZAP70 regulates motility, adhesion and cytokine expression of mature T-cells, as well as in thymocyte development. ZAP70 regulates T-cell activation by modulating T-Cell Receptor expression at the cell surface. Plays a role in T-cell development and lymphocyte activation. Essential for TCR-mediated IL-2 production. Isoform 1 induces TCR-mediated signal transduction, isoform 2 does not. Expressed in T- and natural killer cells. Defects in ZAP70 are the cause of selective T-cell defect (STD) [MIM:176947]. STD is an autosomal recessive form of severe combined immunodeficiency characterized by a selective absence of CD8-type T-cells. Belongs to the protein kinase superfamily. Tyr protein kinase family. SYK/ZAP-70 subfamily. The SH2 domains bind to the phosphorylated tyrosine-based activation motif (TAM) of CD3Z and the non-canonical phosphorylated tyrosine-based activation motif (TAM) of RHOH. Phosphorylated on tyrosine residues upon T-cell antigen receptor (TCR) stimulation. Tyr-319 phosphorylation is essential for full activity. Cytoplasm. Cell membrane. After antigen stimulation, isoform 1 concentrates at the immunological synapse and isoform 2 remains cytoplasmic. Co-localizes together with RHOH in the immunological synapse. RHOH is required for its proper localization to the cell membrane and cytoskeleton fractions in the thymocytes. Our Abpromise guarantee covers the use of ab173192 in the following tested applications. Example ZAP70 standard curve. Background-subtracted data values (mean +/- SD) are graphed. Data provided for demonstration purposes only. A new standard curve must be generated for each assay performed. 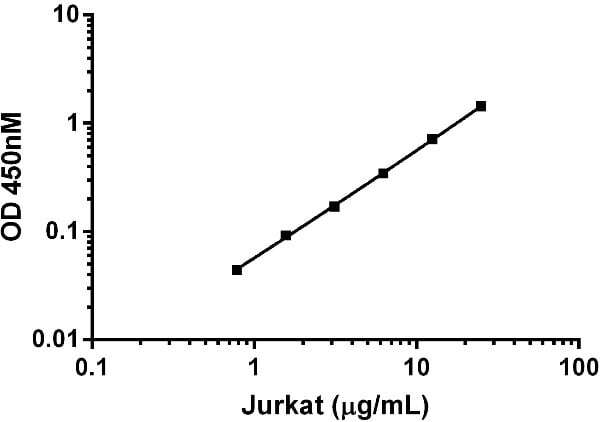 Titration of Jurkat extract within the working range of the ZAP70 assay. Titration of Jurkat extract within the working range of the Zap70 assay. Background subtracted data from duplicate measurements are plotted. Comparison of ZAP70 expression in different cell lines using this ELISA (barchart) and western blot (top). 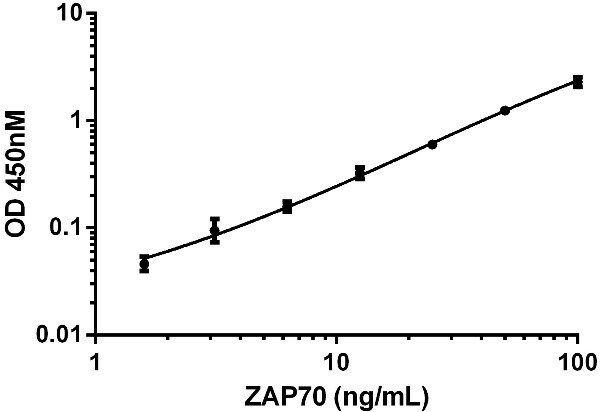 Interpolated values of ZAP70 are graphed for the indicated cells lines based on a extract load of 12.5 µg/mL. 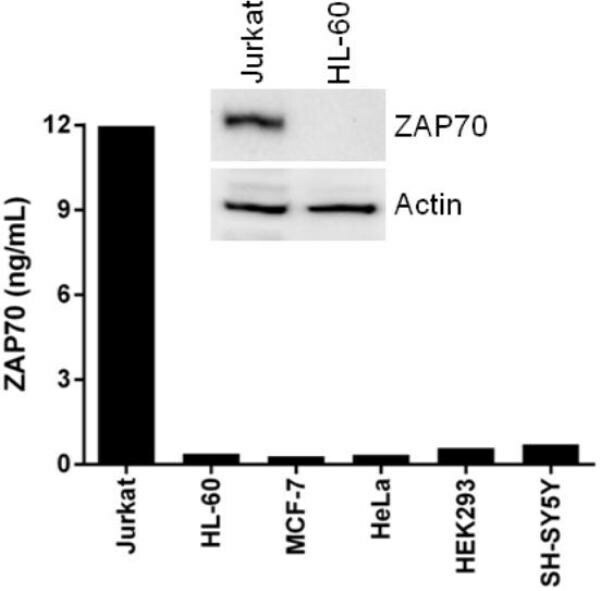 The ZAP70 detector antibody was used to analyze the same extracts by western blot (20 µg loaded/lane). The actin blot is included to show the relative loads of each lysate. ab173192 has not yet been referenced specifically in any publications. Publishing research using ab173192? Please let us know so that we can cite the reference in this datasheet. There are currently no Customer reviews or Questions for ab173192.